For tradesmen who need to regularly measure long lengths or awkward spaces single-handed, there’s nothing more frustrating than a flimsy tape measure that won’t stay put or crumples at the slightest touch. 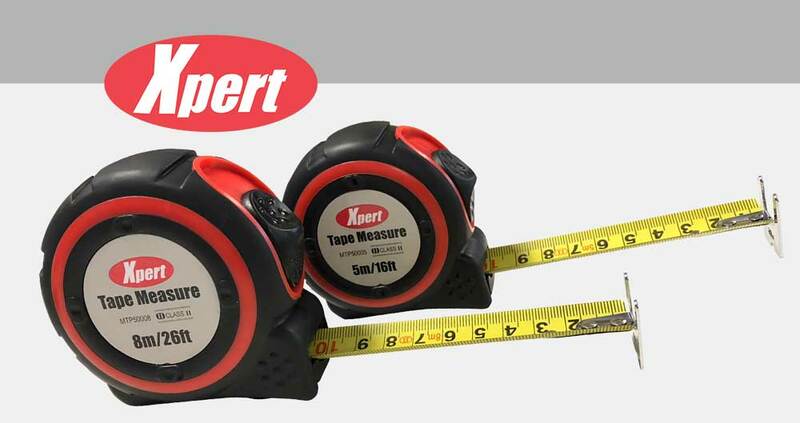 That’s why these sturdy new heavy-duty tape measures from Xpert are built with strength and usability in mind. Available in 5m or 8m lengths (that’s 16 or 26 feet in old money), with metric and imperial units displayed on both sides and a double-sided hook, the durable nylon-coated blade delivers ever-ready, easy-read measuring dexterity at any angle. For quick stops or continuous hold of the rule when measuring, the dual blade break offers ultimate, intuitive control. The rubberised case easily handles general wear and tear, as well as helping to improve grip and increase comfort during use. And when all the dimensions have been taken, the handy belt clip on the back of the tape measure provides convenient, quick-draw storage. Xpert tape measures are distributed exclusively by leading hardware provider, Window Ware, and available to buy from trade counters and retailers across the country. Click here to find your nearest stockist or email sales@xperttools.co.uk if you’re interested in selling them.